Whereas the FARO arm required a carload full of gear and accessories, the Creaform is simplicity in itself. This box you see here is everything needed to do high accuracy 3D laser scanning, minus the laptop. Quite small, no? In fact, it’s so small that it’s legal carry-on luggage for commercial air travel. When I personally flew to jobs with the FARO arm, I had to remove the back seat and then fill that space up with the travel case, tripod and all sorts of accessories. This setup, could fit in the back seat of a VariEze. That means I’ll be able to quickly and easily provide high accuracy 3D laser scanning laser scanning anywhere in the Western US. In fact I’m happy to travel anywhere in the world, given proper budget. 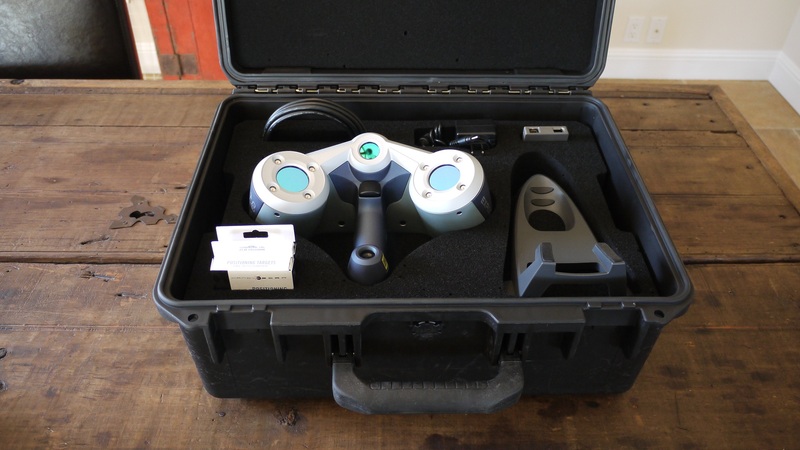 The EXAscan is entirely different from the FARO not just in size, but also in the way that it works. The FARO requires a perfectly steady base for the arm, and also a perfectly fixtured part. My experience with doing aircraft scanning – or really any scanning for that matter – was that getting the aircraft completely fixtured, relative to the arm, is very difficult. The aircraft should ideally be up on jack stands, and even then it’s possible to get movement. Physically contacting the surface itself often meant that the surface would bend or deflect more than the error of the arm. I had long come to the conclusion that really what I needed, solely in fact, was some form of non-contact scanning. I looked at the new FARO Edge arm, and also solutions from Nikon Metrology and Leica. In the end, all of those systems depended on maintaining some fixed relationship between the base unit, and the object being scanned. The way the Creaform unit works is entirely different. Small reflective target dots are placed randomly on the object to be scanned. The EXAscan treats those dots like GPS satellites, and since the relationship of the dots to each other is random, and therefore unique, the EXAscan is able to orient itself in space relative to the object using stereo photogrammetry, and then collect data with the laser scanner. I wouldn’t have believed it worked unless I saw it in person, but it works fabulously! So what’s the accuracy of the unit? Well there are two types of accuracy. The first is the accuracy of the laser scanner, which is 0.0016″. Now, since this unit must orient itself in space relative to the targets, there is also an accuracy associated with that, which is called the volumetric accuracy. The volumetric accuracy is 0.0008″ for the first foot, plus 0.0012″ per foot past that. So, let’s say you have a part that is 10 feet across. You treat the center of the part as the origin, which means you have a volumetric radius from the center of 5′. So the accuracy would be 0.0016″, plus 0.0008″, plus 4 X 0.0012″ (0.0048″). That’s 0.0072″, which is about the same as what it was for my old FARO arm, except that the FARO arm was 25% smaller in reach, and had far more limitations in terms of scanning. There is an add-on option called the MAXshot which allows you to reduce the error of the EXAscan over larger distances. The per foot volumetric accuracy goes all the way to 0.0003″, which is a quarter of what it is w/o the MAXshot. I don’t have any pressing need for scanning on this scale as of yet, but one of the things that really drew me to the Creaform solution was the fact that I could purchase the MAXshot add on at any time after the fact, so if say, you have an entire aircraft the size of a KingAir that you’d like me to scan, by all means, get in touch! I’ll be posting much more in the coming weeks showing the ins and outs of using the EXAscan, along with some of the super cool features that really sold me on the unit. Also, as some of you may know, the hardware side of this is just half the equation. Just as important is the software side of things. Stay tuned for some truly mind blowing developments in the world of converting scanned polygonal meshes into NURBS surfaces! If you are in need of laser scanning services, please by all means give me a call at 831-535-9912. No job too big, or too small!